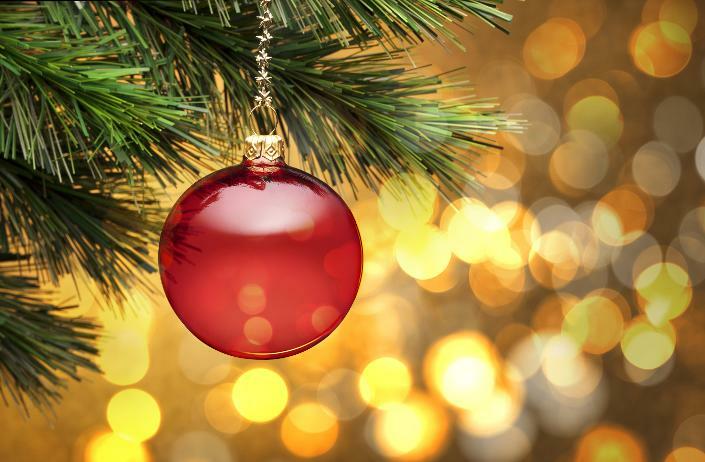 North Shore Smart Home for the Holidays Giveaway! Jonathan Davis, Realtor® affiliated with Coldwell Banker Residential Brokerage in Beverly, MA along with preferred installation sponsor Smart Home Tech LLC are taking the lead in Smart Home technology here on the North Shore. One of the ways the two are sharing their cutting-edge expertise is through the North Shore Smart Home for the Holidays Giveaway campaign. Starting on Tuesday December 6th, for three consecutive weeks Jonathan Davis, Realtor® and Smart Home Tech LLC will be giving away a new Smart Home product which will be installed free of charge for you at a mutually agreed upon time. They will announce the product every Tuesday (12/6/16, 12/13/16 and 12/20/16) on https://www.facebook.com/SmartHomeTechLLC. The winner will be drawn and notified the Thursday following the product announcement (12/8/16, 12/15/16, 12/22/16 respectively) between 10:00am – 12:00pm. To be eligible the winner must be a MA resident with an address North of Boston and East of Route 93 who owns the property in which the device will be installed. If you are eligible you are encouraged to like or share the product announcement post that is made each Tuesday. All FB users who have liked or shared the product announcement post by 9:30am on the respective Thursday will be included in the random drawing. The winner will be contacted by FB message once the drawing has taken place. Click the link to enter the North Shore Smart Home for the Holidays Giveaway! Click the link to read the full press release announcing the Giveaway. Congratulations Anthony and Amanda Podesta! Together, Jonathan Davis & SMART HOME TECH LLC congratulate the Podesta family from Danvers! On 12/08 Amanda's name was drawn as the first winner in the North Shore Smart Home for the Holidays Giveaway. The Podesta's won the August Smart Lock & Connect Device. 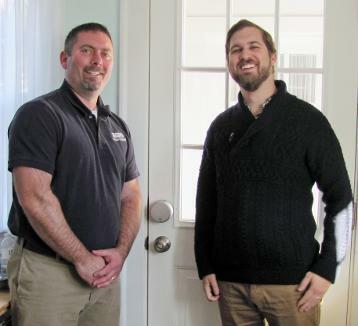 Pictured here are Jonathan Davis and Anthony Podesta after installation of the new smart home technology. Congratulations Nancy O'Neill from Beverly! 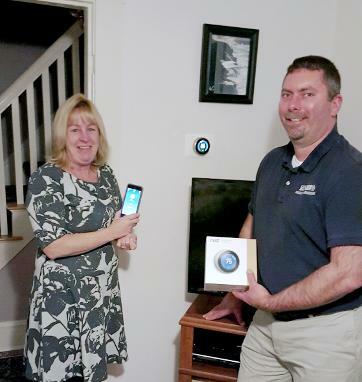 Together, Jonathan Davis & SMART HOME TECH LLC Congratulate Nancy O'Neill from Beverly! On 12/15, Nancy's name was drawn as the second winner in the North Shore Smart Home for the Holidays Giveaway. Nancy won the Nest Learning Thermostat! Pictured here are Nancy and Jonathan after installation of the new smart home technology. Congratulations Lauren Cote from Danvers! 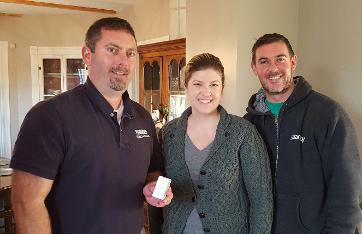 Together, Jonathan Davis and SMART HOME TECH LLC congratulate Lauren Cote from Danvers! On 12/22, Lauren's name was drawn as the third winner in the North Shore Smart Home for the Holidays Giveaway. Lauren won the Lutron Caséta Plug-in Smart Lighting Dimmer Kit! Pictured here are Jonathan, Lauren, and her husband Steve after installation of the new smart home technology.